Here at Lagoon Day Spa Sunshine Coast we like to keep ourselves healthy and well by eating well! Nuts and seeds are good for your health. Good fats, fiber and protein can help make skin supple, smoother and younger looking. 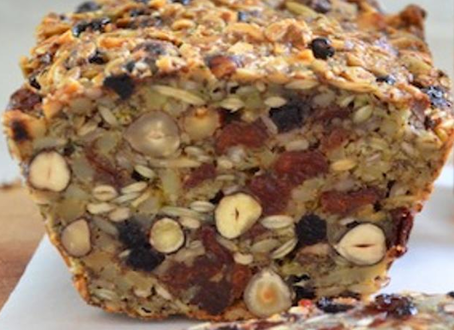 I wanted to share with you my special STONE AGE BREAD, full of healthy nuts and seeds to give your skin a real boost. This bread is full of essential nutrients and because it is filled with nuts and seeds it will keep you healthy and can help prevent disease! Perfect if you’re a busy Mum and need to eat on the run and get a protein boost. It's really easy to make. Mix it all together and then place it in a bread dice. Cook for about 1 hr in a 160 degree Celsius oven. Enjoy! At Lagoon Day Spa Sunshine Coast, we believe that beautiful skin starts with nourishment from within. Did you know that older cells are constantly shed and replaced by younger ones and a steady supply of micronutrients is essential to support this rapid growth? Don’t just rely on your favorite face cream to help your skin, eat your skin healthy too! I am pleased to see that at our luxury day spa Sunshine Coast we are keeping on trend with the massages that we offer. I was interested in a recent 2013, worldwide trend report which points out that Swedish, Thai, shiatsu and hot stone...make way for “the mindfulness massage” in 2013, a creative blend of two effective approaches—mindfulness techniques and bodywork. When combined they can have a uniquely positive, profound impact on people’s stress levels, emotions and brains. As I have pointed out before, the bamboo massage not only stimulates blood circulation, muscular tension and aids in Lymphatic circulation but is hugely beneficial as a stress and fatigue reducer. This will be the move into the future as modern stress levels increase and that mental wellness and psychological well-being is going to be a focus for the future. There is also a thought that that mindfulness can re-wire people’s brains to become less anxious, happier and more focussed and creative. “By integrating mindfulness with massage, clients will not only reduce stress during the treatment, but by engaging in the ongoing component of mindfulness, they may also experience the benefit of brain changes that enable them to become more resilient in coping with stress on an enduring basis.” Dr. Daniel Friedland, President-Elect of the American Board of Integrative Holistic Medicine and Founder/CEO of SuperSmartHealth. For me though, I like the idea of implementing more positive psychology and mindfulness “touches” throughout spas and one I really loved was a spa in the US where guests select a Hope, Love or Gratitude Stone, and are then guided to think about these meaningful concepts during the treatment. There are others that use tools like gratitude journals or feature “gratitude trees,” where people hang messages about what they’re thankful for. ….MMM, plenty to inspire us for the future at our luxury day spa Sunshine Coast! Most people neglect exfoliation in their weekly skincare routine. The average human generates a new layer of skin every two to four weeks. Usually what sits on top of that new strata is a pile of old cells. If you start exfoliating your skin, you will notice an almost immediate difference in your complexion. The Pure Fiji Coconut Sugar scrub will leave your skin glowing and feeling as soft as a baby. Is your skin is feeling dry and tight or are your fine lines more noticeable? It may be a good time to have a moisturiser for dry skin on hand for days when your skin is feeling dry. Go for a creamy cleanser instead of bubbly cleanser, as sometimes changing your cleanser is enough for your skins moisture levels to even out. Give your skin an intense hydrating boost at night with a nighttime moisturiser. Sothy’s Cleansing Milk is PH Balanced and does not leave your skin feeling tight. Facial masks are an excellent way to maintain beautiful skin. They clear out pores, cleanse, detoxify, and hydrate our skin. Regardless of what type of mask you’re using, there are a few essential steps that everyone should follow. Always steam your face over a cup of hot water or press a hot washcloth to your face before beginning a mask. The heat works to soften the debris in your pores and clean your skin. The Papaya Enzyme Exfoliating Masque by Pure Fiji, hydrates, nourishes and smoothes dry skin. Try these four easy tips to help you achieve a supple and glowing skin and banish lack-luster winter skin. If you want to get your skin ready for summer, ask us for specific advice at the Lagoon Day Spa Sunshine Coast and we will recommend the best products for you.